Didn't manage to get early access to Star Wars Battlefront 2 with the Play First trials on EA Access on Xbox One or Origin Access on PC? Don't worry, we've got your back. You can watch us play the first three missions in a galaxy far, far away. Just don't scream at us when we mess up OK? It's a lot of pressure. If you do have access to this early peek, what are you waiting for? You can try out multiplayer modes, arcade, and even some of the single-player campaign (which features events that take place between Return of the Jedi and The Force Awakens) and your progress fill carry over to the full game. 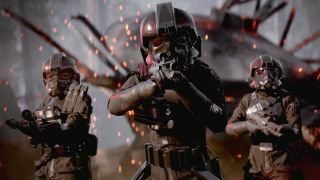 Today we got more details about a new chapter in the single-player campaign called, Star Wars Battlefront 2 Resurrection, from publisher EA. Not bad considering the game isn't even out yet. The extra content will arrive on December 13, as part of "The Last Jedi Season." Star Wars Battlefront 2 will be released on November 17.